May - Jun 2017 APP - Incorporate Augmented Reality(AR) technology in the architecture industry. Serve for practitioners/ students/faculty in design field. Oct - Dec 2018 PAGE Human - Computer Research about future health care. Oct - Dec 2012 Strategic Design to solve environmental problems in urban design. Serve for people with loneliness in cities. No.1 CONNECT July - Aug 2018 UI/UX Design - Create a platform to match the right mate. Feb 2019 - Present Website design for the establishment of a branding design studio. (In progress). Create a product to help improve the environment in place of workerâ&#x20AC;&#x2122;s labor. Siwen Fang Who is She? 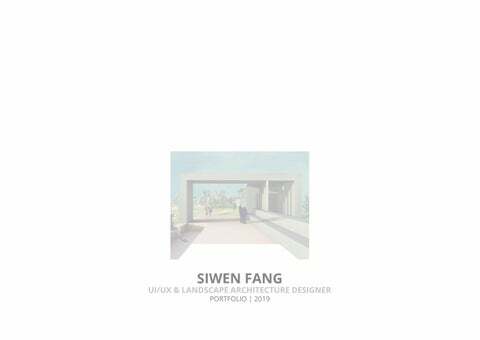 Siwen Fang is a landscape designer working in an international architecture firm. She got her master degree in design school in the US. She stepped into the UI/UX field when back in the US she helped the firm with an APP design. Later, she taught herself about UX design. Apart from 7 years of study in architecture school, she had some research experience about biology when at college. Both design and scientific backgrounds lay a solid foundation for her to become a UX designer. Create a platform for matching the right people accordingly.` Increase the possibility of meeting people. Categorize users based on usersâ&#x20AC;&#x2122; social demand. Effectively matching. Target Users -Young people looking for building new relationships. CHALLENGES Inefficient Match Users with different social demand match only based on photos. I am a college student and very interested in play“ ing the guitar and video games. I would like to meet people with same interest and play together. Users will use fake photos or information as their profile, which will potentially cause online fraud. Not Widely Acknowledge/Accepted by Societ At the moment, people commonly equal online dating to hooking up. In large cities, people always live on the go, and it becomes harder and harder to broaden friend circle. Online dating/ meeting creates a new opportunity. alone and do not want to do anything. Once having good feedbacks from the users, the notion that “dating app = hooking up” will diminish. A Background Check System of Users’ Profile Optimizing the background check will decrease the possibility of online fraud. Categorization means users have the ability to select what kind of mates they want to find in the application. Compare to similar APP in the market, A majority of Applications do not have categorization service and management of the profile review system. In that sense, there is a potential in the market. Customization means the system will learn about users’ demand and gradually cater to users’ taste through machine learning. 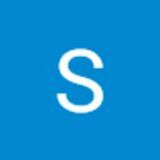 Management means the ability to manage users’ information and guarantee the safety of users’ privacy and reduce the possibility of online fraud or false. Encourage Users to Communicate. Communication among users play a vital role in the APP. There should be an intelligent monitoring system will improve the frequency of interaction between users. (i.e. chatting window will disappear if no communication happens within 36 hrs. Categorizing users by social needs. Not filling a personal profile is not allowed to be registered. Face ID check will be done after upload personal photos. Encourage Users to Communicate. The APP is designed based on User Generated Content. The APP should lead and encourage users to upload or post their own images to avoid online fake information. 1.2- Reduce the time between matching and chatting. Maximum avoid the people online interact with people offline. 2.2- Users Evaluating System Users are supposed to evaluate every mate they match (AI included). High score users can get a bonus. Learn More about Users. Everyone has his own preference and frequency of using the app. It is important to learn more about users through machine learning. For users who want to seek for buddies with same interests within the same cities. There is the future profit potential in collaborating with Gyms & Restaurants. For foodies/sports lovers, they can connect the buddies in the Application and go to those restaurants/gyms with certain discounts. To provide design firm a new way of showing design in 3D. To help reduce to cost of the design process. To help developers/ clients of design firm better understand the design process in 3D. To save time and space. To keep pace with high technology in the architecture industry. To avoid the inconvenience of carrying physical models for long distance. To make it easy to archive the model for future use. The system map shows how the APP/Website works. Designers/ Students will share the project model on the website/APP. All the users can view the AR model through logging into the APP. At the same time, using the same account in the website, both designers and clients can interact with each other. Eventually, achieving the goal of cloud model sharing and viewing by augmented reality. “ Physical model needs more space to put. Physical model is difficult to carry if my boss wants to see the model. of the time, our clients are not in the same city. For most of “ Most the presentation to the clients, I will fly to their office with the physical model. - Want to find a new way of view the project 3d but with more efficiency. - Hope to make further revisions to the models even after the meeting with designers. Some of my previous projects, we asked local model making firm to make the physical model for us. It is convenient to me but sometimes, the model does not meet my expectation. Enter the APP - Home Page for 2s. If having an account, users will log in. Projects that the users are working on will appear on the main page after logging in. For different users, the projects showing on this page are different. Users should aim the camera on the map and the 3d models will appear. IOS/Android Mobile Phone Cloud Co-Model APP will be promoted to the mobile phone to make it more convenient to view the model at any time. With the popularity of technology used in the service industry, the traditional way of people-people has been transformed into human-digital. The system map shows how the “Clinic” works. Firstly, users will input the data information about their body check into the equipment. Then users should follow instructions and get the output & suggestion for further step (whether they should see the doctor in person or not). - One of my experiences of seeing a doctor before. I had a stomachache for several weeks and went to our local hospital. The doctor said there was no equipment in their hospital and asked me to go to the hospital in capital city. I finally traveled around 400km to see the doctor. - Hope to find a clinic easy to go and economically for our family to know more about my body situation on a regular basis. - No need to travel far to see a doctor and get the diagnosis. - For basic disease, no need to see the doctor in person, which makes the process faster. around a dozen need to have a further checkup in order for me to finally diagnose. But most of them had very basic health problem. I often hear some complaints from patients that I am not patient. - Crowded in public spaces in our hospital. - Always too crowded and need to wait hours for only a few minutes to see the doctor - Would rather buy some medicine in a drugstore instead of going to the hospital. - Hope to spend more time on those patients with more serious disease. - Hope to get understood by patients. - Waste a lot of time to go to the hospital and wait in line. - After having a series of complicated checkups, being told I have a cold. - Want to get accurate data of my body situation in a less tedious way. Step 5 Get Diagnosis & Prescription from AI system. Step 1 Input Personal Info (i.e. name, date of birth, gender). The Design Structure is to imitate the traditional labor window process because users are familiar with this communication logic. Measure Height, Weight, Blood Pressure, Heart Rate, Body Temperature. The traditional process requires users to go to various places and needs more labor in order to make the service work. Measure Basic Data of the Body. Step 3 Talk to the AI system about the symptom. Step 6 See Doctor Face to Face. AI System will suggest the right doctor for the user to pick. What is Aladdin’s Magic Carpet? Aladdin’s Magic Carpet is the metaphor of the product design, aiming at solving the problem the city is facing. The design takes the workers as a research object. From the perspective of liquidators, the design tries to solve the problem of the city. Conclusion: Demand for the sanitation worker Each area, the distribution of workers is less than the demand. SANITATION WORKERS BETTER LIFE ?? LIVING IN A CITY FULL OF RUBBISH!